It is said that if you want to predict major events in someone’s life, then look at the charts of their close relatives. In the absence of a chart for Scotland, we need to look through the lens of the UK chart and see what is happening there. First of all though, I don’t think that astrology on its own predicts much. It says a certain amount: for instance, we are currently in the latter stages of a square from Uranus to Pluto, that has impacted in a big way on the charts of all the major powers. So the astrology on its own has been saying with some certainty that the West would go through a major crisis and renewal over this period, and with less certainty but with high probability (based on history) that this crisis would centre around the economy. 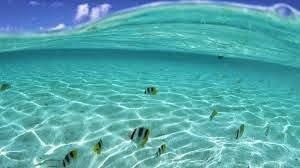 The collective divinatory sea that has built up around the symbols involved tells us that much. It shows shapes in the mist. To see more clearly, you need the individual divinatory skills of the astrologer, his or her ability to use the symbols to see something beyond them. And it’s the same with the Scottish referendum. The astrology on its own does not tell us which way it’s going to go. What it does say – through comparing a number of charts – is that something major is going on, and that even if there is a no vote, the impact will be lasting. 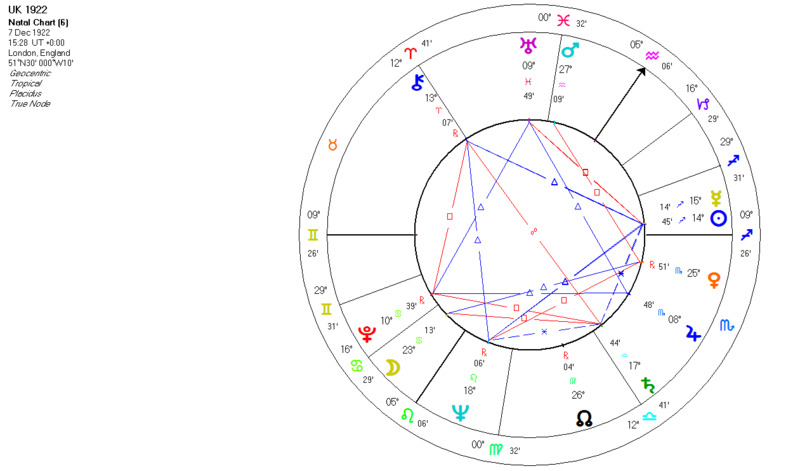 The usual chart for the UK that astrologers use is the 1801 chart, the union of England and Ireland. Astrology is a symbolic rather than a literal, exact art (too much insistence on accurate data suggests that somewhere you are missing the point), and it’s as though a chart and a person/country grow into each other through repeated use. Like the US Sibly chart, which works well for the USA, but which is based on a symbolic rather than a literal time. And maybe it has worked better as time has gone on? That might be worth researching. 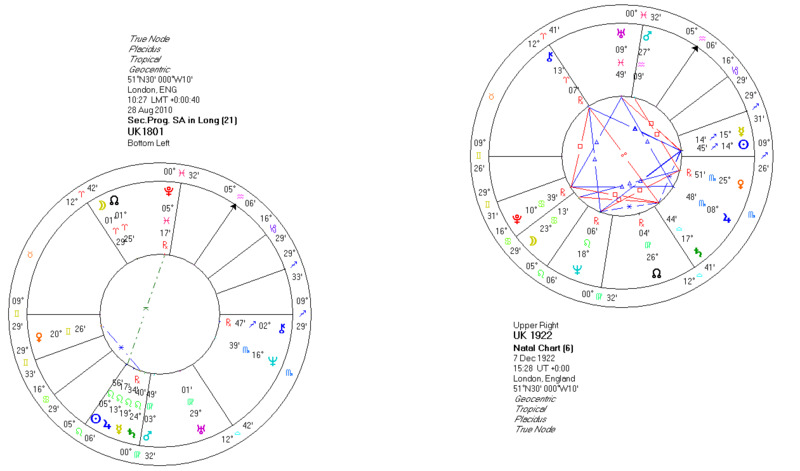 The UK 1801 chart is emerging from Uranus and Pluto hard-aspecting its Sun and Angles. And the UK has been going through an identity crisis for some years now. Do we remain part of the EU? 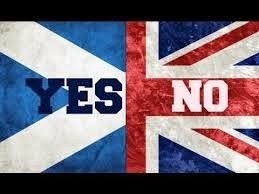 Will Scotland leave the UK? Even the traditional party-political set-up has shifted: we have the 1st coalition government since WWII, and UKIP has arisen as a serious challenge to the Tories. The transits are set to continue as Uranus and Pluto move on to hard-aspect the UK Moon at 19 Cancer between now and approx. 2018, which covers the EU referendum in 2017. The Sun is the leadership, the MC is the State and the Moon is the people. So changes to the leadership and state, leading to a change in the people a few years later. Big changes that take time to absorb and settle. The referendum takes place on 18 September. 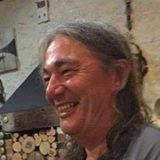 My view is that the crucial astrological event of that day is a Lunar Return – the Moon will at one point be in exactly the same place, 19.26 Cancer, as in the natal chart of the UK. And it is the planet of the people, in the sign of homeland, a conservative sign. And at the exact moment of the Lunar Return, whether set for London or Edinburgh, the Sun and Angles will be in the late degrees of the mutable signs. This is not a good time for beginning a new venture – you want cardinal signs for that. 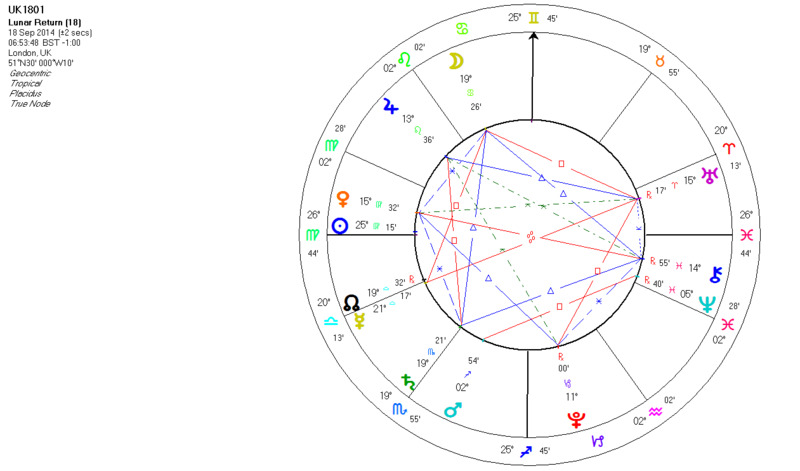 The Iraq War was begun under Sun and Angles in the mutable signs (Sun at 29 Pisces) and that was a mess. It was able to begin because a collective hysteria had been whipped up, and I don't think this applies very much to the Scottish Referendum. So this analysis suggests that the vote will be No to independence. If Scotland were desperate to get away, then I would read the mutable emphasis as a natural unravelling of the Union. But that is not the case, so it would take Cardinal energy to make it leave. At the same time, all this is happening under such intense transits to the UK Chart – the biggest in our lifetimes – that it will still be a seismic event. Something is being awoken in the people (Uranus square natal Moon over the next 2 years) on both sides of the border. Either way, Scotland will have increased powers of self-governance a year or two from now. Another referendum is perfectly possible when Pluto opposes the UK Moon in 3 to 5 years’ time (and that transit will also describe the EU referendum of 2017.) It may not, however, be orchestrated by Alex Salmond. His Sun is at 9 Capricorn, so his moment is now. The chart for the Union of England and Scotland in 1707. Pluto (shift in power) will be conjoining the ascendant of this chart in 2 years time, Uranus (breaking away) is squaring it right now. On the day of the referendum, the Moon will pass over the Moon-Desc conjunction in Cancer, which is very significant. This chart suggests something powerful is happening to the Union, and as it’s not getting closer, it suggests it is pulling away. The angular Mars at 20 Cancer is very significant, and like the 1801 Moon will be activated by Uranus and Pluto in the coming years. So again, if not independence now, then it looks likely in a few years. The chart for the gradual disintegration of the UK, as I call the chart for 1922, when Eire left the Union. 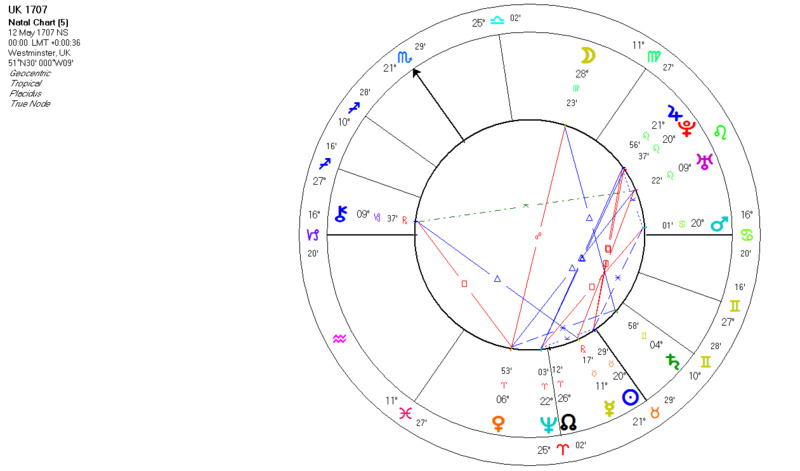 What we see here is Neptune (dissolution) squaring the Asc next year, and then squaring the Sun in 3 to 4 years’ time, as Uranus and Pluto do their work on the Moon at 23 Cancer (whose sign and degree connect it to the UK 1801 chart). So again, we have a similar message to the 1801 and 1707 charts. My overall conclusion is that Scotland will indeed become independent, but probably in about 5 years’ time rather than now. 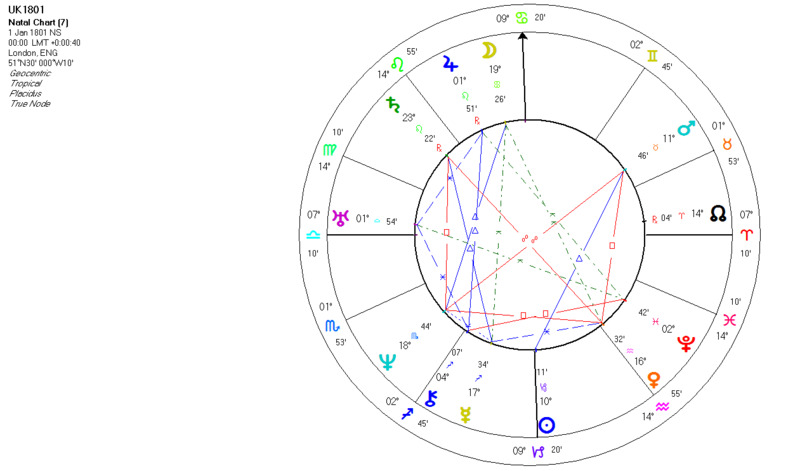 Here’s a slightly uncanny one: the 1922 UK disintegration chart has MC at 5 Aquarius. 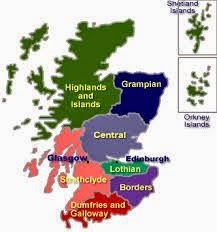 If we progress the 1801 chart (the UK at its maximum size) to 2010, when the Scottish government published its 1st draft bill for a referendum on independence, the MC of this chart was also at 5 Aquarius. So the UK as a state (MC) moving into a period (progression) of disintegration (MC of 1922 chart). Yes indeed - good one, again, Barry. Though I tend to identify the 1707 chart as more valid for Scotland - that will have been the time when Scots *felt* they had lost their independence or nationhood. The 1801 chart was arguably more for London interests - though London interests are precisely what drive many Scots to seek independence now. Whatever the outcome, this does mean quakes in the way UK is governed. If even people in Birmingham feel unhappy about London's interests, something deep is going on, and we owe it to the Scots for starting off what will probably be a major devolution process. Which, interestingly, London started by awarding itself relative autonomy through the mayor and his powers. And isn't it a strange hypocrisy that London is quite assertive in hanging on to Scotland, conducting quite a negative campaign against independence, with a noticeable lack of vision, while also talking up the idea of leaving or semi-detaching from Europe? There's quite a noticeable lack of vision to that too: it's couched in anti-Euro feelings rather than a positive vision for UK. Interestingly, I heard a Plaid Cymru spokesperson saying that the Welsh accept the union, but if UK is to leave Europe Wales wants independence (and to stay in Europe). So this is an interesting kind of nationalism - not entirely a full independence movement. It's saying, no to England, yes to Europe - in a sense a shift of sovereignty. This harks back to 20ish years ago when there was talk of 'the hundred region Europe' - a concept which the main nation states, France and UK in particular, resisted and tamped down. But this (and Catalan and Basque) nationalism is reviving that concept by the back door. Perhaps the problem for Europe is the nation states, founded as they were by conquest and royal prerogative. Scotland's 1005 horoscope is in this post, at the end of which is a link to my current post specifically about the Independence Referendum. Thank you for a great insight. It is already clear that your predictions of a "no" vote and significant changes in the UK are playing out in real life. I wonder what your views are on the British election next year. I had this post in my head all through the last few days. You had it absolutely spot on, well done! I really hope you'll be able to take a look at the new SNP leader whoever he or she turns out to be. There is a genuine sense of a real change in the electorate, not just those north of the border; the clamour for change here in Yorkshire and the North in general is growing apace. I'd be fascinated on your views of the astrology of all of that, too.